A couple things jump out here: Even though the labor-participation rate is almost as low now as it was then, the workforce has grown faster than the population (which was 220 million then and is around 319 million now). 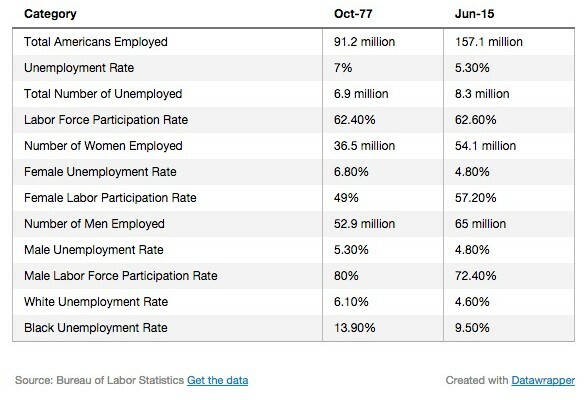 The big jump is in the number of women employed—from 36.5 million in October 1977 to 54.1 now. Male employment has also climbed, but not as much. So as the female labor-force participation rate has climbed, the male rate has dropped, from eight in 10 to barely seven in 10 men working full time. And whereas the male unemployment rate was much lower in 1977, now there’s gender parity. Even as the gender balance has shifted, it’s noticeable that the racial balance hasn’t. Now, as in 1977, the black unemployment rate is much higher than the national rate, and lags far behind white unemployment. This isn’t all just evidence of a bad economy—much of the decline comes from Baby Boomers reaching retirement age and checking out, though some of it comes from would-be workers who simply can’t find work, and millions more Americans are underemployed. That isn’t without challenges: An aging population could draw more in benefits than the government collects in social-security taxes. Massive spending on health care for older Americans could be a drag, too. There’s more to read at the site, in particular what Americans were doing for work back then versus today, but I find the role of women in the workforce to be most interesting. With more women now graduating college than men how many households of the future will see a reverse of the traditional roles of breadwinner (men) versus secondary income/homemaker (women)? We’ve already seen a huge shift in household composition away from the traditional roles – more dual income homes, single parent homes, women as primary breadwinners, etc. – but it seems clear that the shift will continue over the next generation. What will the impact be on our society? We’ve already lived through a generation of women struggling to balance work and home life, to face the never-ending tension of career versus kids, but we’re about to be confronted with men having to confront a similar situation over the next generation. The reality that men’s traditional role as primary breadwinners or “heads of household”, at least according to our societal norms, is beginning to dawn on America. Over the next generation the big question is going to be how men will handle being the secondary earner and likely primary caregiver to their children? How will society, especially other men, react to them and treat them when they do? I suspect they will go through many tumultuous days trying to find the right balance, just as many women have for years, and it’s often going to be ugly. Can they do it? You bet, but it’s going to be a painful process as they learn to do it. The share of marriages where women work full time but men don’t is highest for low-income families. The story here has as much to do with the decline of working men as it does the progress of women in the economy. In just the 10 years between 2000 and 2010, the manufacturing sector lost an astounding 5 million jobs. Since manufacturing jobs historically have been held predominantly by men, this left lots of men out of work. Women, on the other hand, have benefited from the employment boom in the service sector, which employs more women than men. High-income families are much more likely than average to have both spouses working full time. The message is pretty clear: It’s pretty hard to be rich with only one income. This entry was posted in Current Affairs and tagged head of household, jobs, traditional gender role, unemployment, women and men on July 6, 2015 by Jon Lowder.